Director Paata Tsikurishvili dispenses with the fair immediately, as three saintly representatives of the world’s religions are hijacked by three demonic witches (Philip Fletcher, Mary Werntz and Sarah Taurchini) who seethe with foulness. The object of their corruption, fearsome soldier Macbeth (Irakli Kavsadze), already seems destined for hell with his hollow eyes. 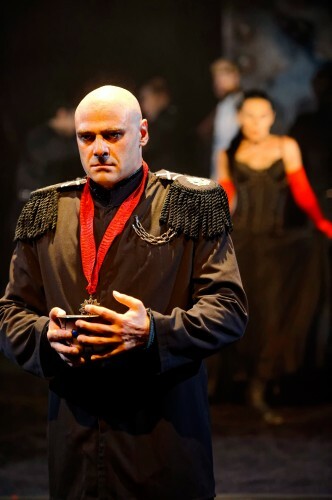 His wife (Irina Tsikurishvili) is already dripping with metaphorical blood in shocking red gloves. It doesn’t take much to push these two over the edge of ambition into murder and madness. If there’s a flaw in this production, it’s simply that the Macbeths as portrayed here are already pretty repulsive. In a seductive way, yes, as they slither deeper into depravity, but they don’t have much of a journey from fair to foul. That’s a ponderous atmosphere to hang out in, even for ninety minutes. Perhaps it just more strongly highlights for me the company’s progression to their more psychologically subtle work, like last year’s Othello. But Macbeth also does succeed, especially when it showcases Synetic’s ability to mix in comedy in a rather startling way – as when the ghost of Banquo (Ryan Sellers) appears at a chillingly hilarious banquet populated by robotic guests, while Lady Macbeth nonchalantly smokes, like a majestic Dietrich in a cowboy saloon. When the witches mime Macbeth’s invincibility to “no man of woman born” with the grotesque leers of nightmare midwives, it has the punch of a sick joke. The ensemble has reached a point where they telegraph the metaphor and meaning inherent in Irina Tsikurishvili’s choreography with extreme effectiveness, and it still generates a riveting response. That clearly defined aesthetic is equally apparent in the production design, with the cold darkwave world of Anastasia R. Simes’ set/costume design well matched by the industrial electronica of Konstantine Lortkipanidze’s music. It’s a killer goth club atmosphere against which these devious Macbeths can tango, in a true danse macabre. Synetic Theater‘s production of Macbeth runs now through October 2, located at 1800 South Bell Street, Arlington, VA. Closest Metro stop: Crystal City (Yellow/Blue lines). For more information call 1-800-494-8497.